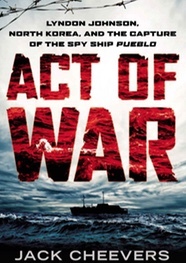 Jack Cheevers is author of “Act of War: Lyndon Johnson, North Korea, and the Capture of the Spy Ship Pueblo,” published by New American Library/Penguin. He lives in Oakland, Calif.
On Jan. 23, 1968, North Korean gunboats unexpectedly attacked the USS Pueblo, a small, dilapidated American spy ship monitoring military radar and radio stations along the communist coast. One sailor was killed and ten more wounded during the bloody capture of the U.S. Navy vessel, packed with advanced electronic surveillance gear, code machines, and hundreds of pounds of classified documents. It was one of the biggest intelligence debacles in U.S. history – “everyone’s worst nightmare,” according to a National Security Agency historian. The 82 surviving crewmen – most in their 20s – were thrown into North Korean prisons and tortured, malnourished, and forced to participate in communist propaganda exercises for 11 months before U.S. negotiators finally got them released. Their ship, however, never returned home. It remains in North Korea to this day, moored near the spanking new Victorious Fatherland Liberation War Museum in Pyongyang. The museum is devoted, in its Orwellian way, to persuading credulous visitors that North Korea “defeated” the United States and its allies in the Korean War. Wearing his trademark black Mao suit, North Korean leader Kim Jong-Un cut a red ribbon at the museum’s opening in July. The Pueblo is the only commissioned U.S. Navy vessel held by a foreign power, and many of its former crewmen want it brought home. For them the ship’s repatriation would be a form of closure, not only ending a long national humiliation but also easing the personal trauma of their dreadful experiences at the hands of sadistic captors. But North Korea is about as likely to give back its pirated prize as the British Museum is to return the Elgin Marbles. To North Koreans, the ship is a cherished symbol of their proud and daring victory over the Yankee spy dogs and their vicious imperialist puppeteers in Washington. Like the aging sailors, I grind my teeth at the very idea that the Pueblo – attacked in international waters during peacetime – is still in communist hands after all these years. But its presence in the Pothong River in Pyongyang does serve one useful purpose, reminding Americans that spy missions, when sloppily planned or executed, can expose our nation to extraordinary dangers. Once a World War II-era Army freighter, the Pueblo was converted into a cutting-edge eavesdropping platform in 1967 as part of Operation Clickbeetle, the Navy’s secret effort to match the Soviet Union’s fleet of surveillance boats disguised as fishing trawlers. The cheap, unobtrusive Russian vessels tracked the movements and tactics of U.S. warships around the world. An unspoken gentlemen’s agreement applied to American and Soviet spy ships. As long as they didn’t interfere with ours, we didn’t interfere with theirs. When Navy and National Security Agency officials were planning the Pueblo’s schedule of voyages in the Far East, they assumed North Korea would play by the same rules. As a result, the lightly armed Pueblo was sent cruising close to the shores of one of the world’s most unpredictable regimes with no U.S. warships or combat jets to protect it. Nor was it supplied with any means of quickly destroying its large cache of top-secret hardware and papers. Its crewmen were issued only fire-axes and sledgehammers to break up well-built electronics, and pitifully slow shredders to get rid of a mountain of classified documents. Just two days before the ship arrived off the North Korean port of Wonsan, North Korean commandos nearly succeeded in assassinating South Korean President Park Chung Hee at his official residence, the Blue House, in Seoul. Both South and North Korea put their armed forces on high alert, and many feared that Pyongyang’s astonishing act of international savagery would trigger a second Korean War. Yet no one warned the Pueblo of the incendiary events on the Korean peninsula or ordered it to withdraw until tensions died down. Following the Pueblo and Blue House outrages, President Lyndon Johnson ordered a massive buildup of U.S. military power in and around South Korea, dispatching 360 American warplanes and a 25-ship battle group, led by the aircraft carrier USS Enterprise. Soviet warships and aircraft moved into the Sea of Japan, and the stage was set for a disastrous confrontation. Fortunately, the Johnson administration reached a peaceful resolution of the standoff, signing a false apology that the Pueblo had intruded in communist waters. In a scene out of a Frank Capra film, the emaciated sailors were freed and reunited with their overjoyed families in San Diego on Christmas Eve 1968. From that day until this, U.S. ships, aircraft, satellites, and human agents have kept the closest possible tabs on our enemies and potential enemies. (Indeed, as documents leaked by Edward Snowden indicate, the National Security Agency has eavesdropped on some of our friends, as well.) We live in a dangerous world, and there’s no substitute for the best, most up-to-date information on our foes’ capacity to injure us or our allies. But spying on other countries is an inherently provocative act, as the Pueblo affair illustrates. We as citizens, our congressional oversight committees, and our media must rigorously and continuously scrutinize our intelligence agencies, to ensure that they do not incur excessive risks with poorly conceived spy missions. North Korea’s gloating display of the Pueblo as a war trophy and tourist attraction may stick in our collective craw, but the ship’s fate forces us to remember that negligence and myopia in surveillance operations can bring nations to the brink of war.